Knowledge is different from information. Both are needed for effective decision making. 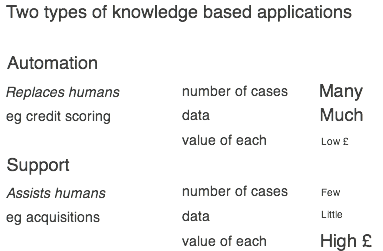 Knowledge of a domain helps identify which information is relevant. Strategic Knowledge Management addresses the four major weaknesses in the strategic decision making process. Strategic Knowledge Tools require explanatory power. Fuzzy logic provides this. 1. Knowledge - What is it? A successful business makes good decisions, implements them well - and then learns from the experience in order to do better next time. To make a good decision, one needs not only information about the specific instance, but also an understanding of the domain. In other words, one needs a set of principles, models, templates or other abstractions. These abstractions are then re-usable for making new decisions with different information. Knowledge is re-usable - unlike information which relates to specific instances. 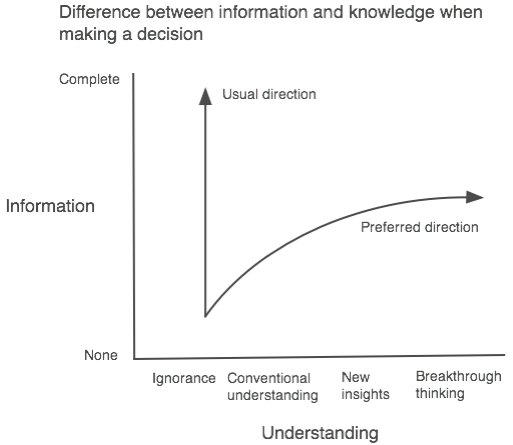 Knowledge is a set of re-usable abstractions that assist understanding and provide meaning to decision-making. Information is about specific instances and is the raw material of particular decisions. For instance: Consider a civil engineering business that builds bridges. Its knowledge is in its understanding of how to build bridges, how to manage projects, how to handle finance etc. This knowledge is re-usable. Its information is about specific bridges, budgets, suppliers etc which are essentially transitory. If it knows how to build bridges but has no information about particular bridges that need building, it is not going to be in business for long! Conversely if it has a lot of information about particular bridges but no understanding of how to build a bridge, it will soon be out of business. It needs the combination of knowledge about bridge-building AND information on bridges. 2. Knowledge and Information - They are different! How often have you heard Boards of Directors defer a difficult decision and ask for more information? The reason, in many cases, is that they inadequately understand the key decision drivers and how they impact the decision. They seek comfort in asking for more information. Managers often mistakenly seek more and more information instead of better knowledge or understanding. Better understanding enables the identification of what information is relevant. Consequently, less information is required because the irrelevant can be ignored. Better understanding, at the conventional "best practice" level, can be the springboard to innovation. Could Einstein have developed the theory of relativity without an understanding of standard best practice, i.e. Newton's Laws of Motion? It would have been much more difficult. The challenge is to encourage the capturing and understanding of business best practice at the strategic level to improve performance and provide the platform for dramatic innovation. Business decisions come in all shapes and sizes - small and large. The small I will call tactical or operational; the large I will call strategic. Operational decisions are typically many and small with sufficient prior data on which to build a knowledge base. This is the field of data-mining and neural networks. Knowledge based systems for tactical decision making can be automated taking human understanding out of the loop except at the boundaries e.g. credit scoring. Strategic decisions are typically infrequent, each of large value with little formal prior data of similar decisions to build understanding on, and requiring business judgement, and the balancing of qualitative trade-offs. Making a business acquisition is an example. Knowledge-based systems that help in strategic decision-making assist the human decision-maker by enhancing her understanding. This is the subject of this paper. There are four potential weaknesses in the strategic decision making process. The process of obtaining relevant information. The process of re-using existing knowledge and avoiding the NIH (Not Invented Here) problem. 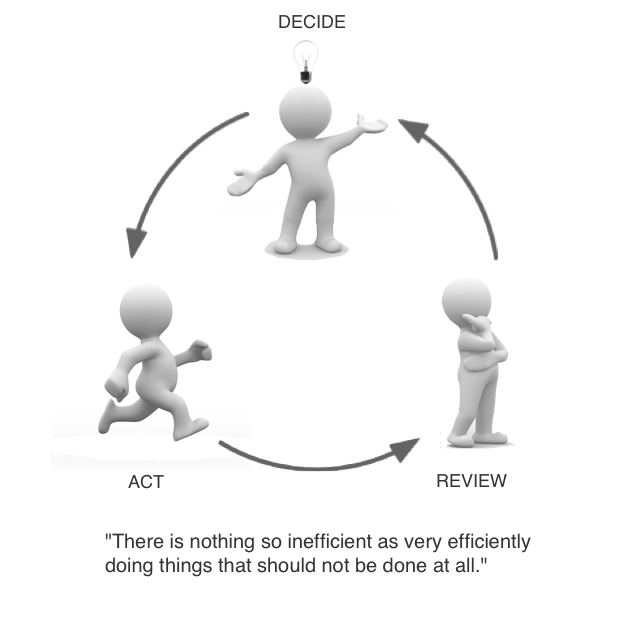 The process of making good decisions quickly - i.e. not making bad decisions quickly nor avoiding making any decision at all. Having made a decision, the process of turning the decision into action. This paper addresses all these weaknesses. The knowledge used in making strategic decisions are often expressed in words as "business principles" or "rules of thumb". If you listen to business people discussing a strategic decision you will often hear these "rules of thumb". "If a customer is wealthy, they are likely to be less price sensitive"
The source is either from their own business experience, or from business consultants or business schools, or the latest management books or gurus. You will recognise these "business rules" as fuzzy rules with fuzzy states such as "poor", and fuzzy impacts such as "likely to be". These fuzzy rules can be combined using fuzzy logic into a knowledge system. There is a cycle to the creation and use of knowledge. We have already mentioned how increased understanding of current best practice in strategic thinking can lead to innovative breakthroughs. Current knowledge is explicitly represented. It is processed by human brains (together with information about the specific issue at hand) leading to understanding, decisions and action. This is sometimes accompanied by new ideas or hypotheses. If supported, the new ideas lead to innovative actions, and also to new knowledge that is added to the explicit representation of current knowledge. It enhances human understanding rather than replacing it. It identifies what information is relevant so the rest can be ignored. It supports innovation and learning.